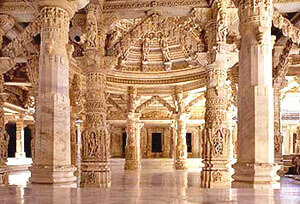 Dilwara Temple is one of the finest and architecturally renowned Jain temples in India. A large number of visitors and pilgrims visit this temple every day. Its extraordinary architecture is its major attraction. Intricate carvings on the marble stone and high-quality craftsmanship of the workers is clearly visible in every aspect of this temple, making it truly unique and distinct. Its opulent entranceway is truly stunning and spectacular. The temple is located amidst verdant surroundings. Visitors coming here enjoy the sense of peace and tranquillity and experience a divine connect with the Ultimate Power. This temple complex has five sections dedicated to five Jain Teerthankaras. These sections are dedicated to Lord Mahaveer Swami, Shri Adinathji, Shri Parshavnathji, Shri Rishabdaoji and Shri Neminathji. Vimal Vasahi or Lord Adinathji’s Temple is considered as the oldest temple from among these. The temples were constructed between 11th to 13th centuries. The intricate stone carving on the marble pillars and ceilings is truly awe-inspiring. The temple displays a lot of images from the Hindu and Jain Mythology. The profusion of petals, lotus buds, and flowers carved on the ceilings and pillars lend a distinctive look to the temple. Carved corridors, courtyards, arches, and porticos are other distinctive features of the temple. Located almost 2 ½ km away from Mount Abu, it is very easy and convenient to visit this temple. Many state and private buses are available offering their services from Jodhpur, Udaipur and other major cities of the state. Private taxis and cabs are also available. The nearest airport is in Udaipur, almost 185 km away from Mount Abu. 28 km away from the Temple, the Abu Road Railway Station is located. The place is well connected with the major cities of the state and the country. Visitors can visit the temple from 12 Noon to 5 PM.